Part of Ottawa's cycling network could be in jeopardy after the newly-elected Progressive Conservative government cancelled the cap-and-trade program. The City of Ottawa could delay a number of cycling infrastructure projects after the province pulled cap-and-trade funding. Part of Ottawa's cycling network could be in jeopardy after the newly-elected Progressive Conservative government cancelled Ontario's cap-and-trade program. The city was notified by the Ministry of Transportation on July 4 that the Ontario Municipal Commuter Cycling Program (OMCCP) — funded by revenue from the cap-and-trade program — is cancelled, and that no further funds will be issued. The city is allowed to keep the $9.7 million it was given under former premier Kathleen Wynne's Liberals, which was received on March 29. The majority of that funding — $6.9 million — is being used for the Rideau Canal crossing, a pedestrian and cycling bridge connecting Clegg Street in Old Ottawa East and Fifth Avenue in the Glebe, according to Vivi Chi, the city's director of transportation planning. The bridge is already under construction and is going forward as planned. Another 11 projects were expected to move forward with funding from the cap-and-trade program, but run the risk of being put on hold until the city finds alternate funding. The projects include work on O'Connor Street, Booth Street, Wellington Street, Laurier Avenue, Donald Street, Scott and Albert streets, Heron Road, and several pathways. In a statement to CBC News, Chi admitted the cost of the projects exceeds the allocated amount because "there was an expectation at the time that the Ontario Municipal Commuter Cycling Program would continue." Chi did not provide an estimated cost for the future projects, saying they're still in the planning stage. "Without provincial support (and at this time an alternative funding program hasn't been announced), the city will continue to implement its cycling program but not at the aggressive pace of the past few years," the statement reads. Chi said city staff are reviewing the remaining projects and while they are expected to move forward, there's a question of how quickly it will happen. 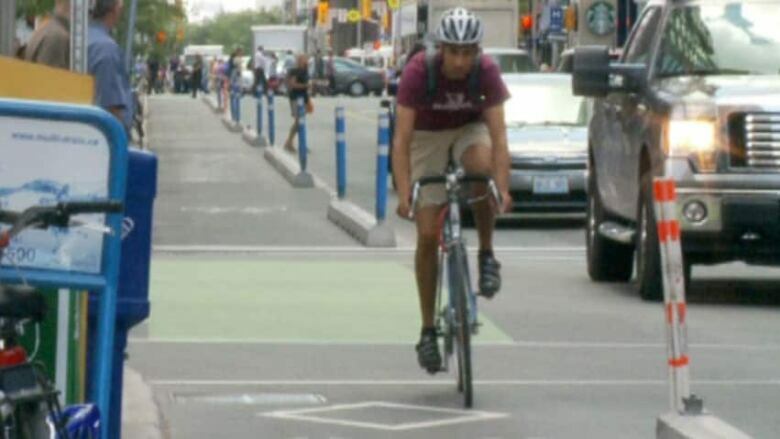 "The fact that we won't be able to accelerate these projects to the degree that we might have hoped means that cyclists are less safe for longer because we don't have the segregated cycling infrastructure we'd hoped to have," said Kitchissippi Coun. Jeff Leiper. He called the decision to cancel cap-and-trade program disappointing. Part of the Scott and Albert cycling corridor project is in his ward. But a provincial cycling advocacy group is optimistic the Ontario government will implement another revenue stream. "The momentum is there to build safer, more accessible communities that include cycling, and I'm optimistic that we will be able to continue that momentum moving forward," said Jamie Stuckless, executive director of the Share the Road Cycling Coalition. He said it will take a significant rejigging of the city's budget to pay for other cycling projects that may have been covered under the OMCCP, and he's not optimistic that money will be replaced by the province. "Given the direction of where this government is going, I think a lot of us are cynical there's going to be a big new pot of cycling money," he said.